Here are some of the latest lodging specials at Mission Point Resort. For a complete list, visit Mission Point Resort Website. Mission Point Resort on the shores of Lake Huron on Mackinac Island in Michigan offers a tranquil setting with cozy amenities to enjoy life's simple pleasures. See you on the 13th and 14th of May!! 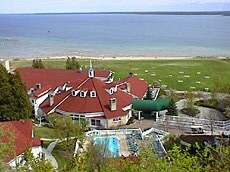 We can't wait, we absolutely love Mission Point and Mackinaw Island!! Winter is one of the six letter words we do not discuss in late April. Next up for discussion is Summer. Just booked! First time visitors - we are excited! I see the banner, but what is the rounded edged item? These are so cool! Is there any way the public would be able to order anything similar? My fiancé and I are getting married at Mission Point next summer and we are still thinking about what kind of decorations and favors we want to do! These are so cool!!! Will these be available for purchasing? They are so adorable! Just adorable, can't wait to purchase some as well! Our season opening is right around the corner and now is the time to begin planning your Mackinac vacation! Go kayaking and see Arch Rock from the water. Even though when visiting in the summer, definitely bring jeans and a sweatshirt for the evenings. It can get chilly. Few years ago, when staying on the island in July, the one day it was sunny and in the high 70's. Next day is was cloudy and windy. We were wearing jeans, sweatshirts and light jackets. Take advantage of the lawn at Mission Point. The white adirondack chairs symbolize northern Michigan island life. Excited to experience the new room decor this season during our stay. Look for treasures in the bushes. My wife and I love staying here. To sit on the front lawn and watch the ships and the water. Great place to stay. Half of the road still has snow. Jennifer 'Czarnecki' Miodynski, weekend get away with the kids?